Small insurance agencies across the country are actively pledging their time and resources in an effort to make a difference in their community by becoming involved with charitable causes. Deserved or not, many insurance agents often find themselves being pigeonholed into the stereotyped of the annoying, “you need more insurance,” sales-focused Ned Ryerson character from the movie Groundhog Day. People just don’t understand the important work insurance agents do every day to help people protect their families. They don’t understand the commitment many agents have to being socially responsible and contributing members of the local business community. Sure, there are a few Ned Ryersons out there who foster that unflattering image. But for every Ned Ryerson, there is a Scott Campbell and an Yvette Holguin, and a Gregg Blanchard. The Scott Campbell Agency in Waukesha, Wis., recently teamed up with Good Friend Inc. for a new charity campaign to raise awareness about autism and generate funds to help the organization teach acceptance of differences and foster empathy for students with ASD. Holguin’s agency in Arlington, Texas, recently volunteered to help with the Special Olympics Texas and is also raising funds for a local teen-ager battling a very aggressive form of childhood cancer. Blanchard’s agency in South Florida recently launched a new charity campaign to raise funds and awareness for the Stop Bullying Now Foundation. 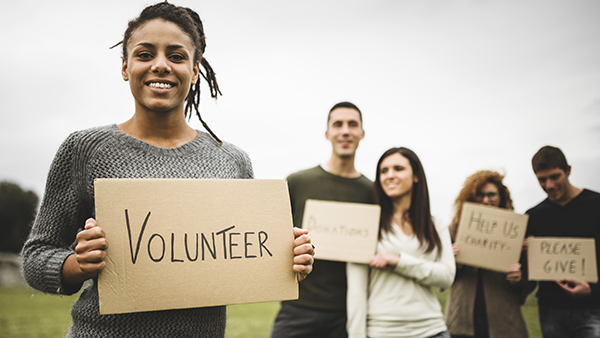 These are just a few examples of how a variety of small insurance agencies across the country are actively pledging their time and resources in an effort to make a difference in their community by becoming involved with charitable causes. Doing so helps them raise awareness not only for worthy causes, but also raises their own profile and helps them establish credibility within their community. What the aforementioned agencies all have in common is they are part of a year-old program called “Agents of Change,” created by Miami-based Agency Marketing Machine. AMM was founded by Jay Adkins, an Allstate agent who was looking for ways to consistently grow his agency by increasing client retention, bundling more policies and generating referrals. Adkins wanted to change the perception of his agency and insurance agencies in general while also finding a way to give back and become more involved in his community. It helps to differentiate the agency not only from the competition but also to distinguish it even from other types of businesses in the community. Simultaneously, the agent is able to build and deepen relationships with clients and raising awareness of the agency itself as well as the cause. “We’re really trying to make agents stand out above other agencies in their area, so they’re not seen as just a commodity with set insurance prices,” said Chris Parrish, senior account manager with AMM. Here’s an example of the how the program works, via the Scott Campbell Agency. April marked Autism Awareness Month, and Campbell said they really wanted to make an impact in the lives of everyone in the community affected by Autism. “Good Friend Inc. is a wonderful organization and we are proud to be supporting them and learning through them about the acceptance of differences. We are committed to having a very successful campaign and one that will not only raise funds but create awareness at the same time,” Campbell said in a press release announcing the campaign. The insurance agency promotes a campaign like this over the course of a two-month period through its social media channels, email and text message communications, as well as through a monthly digital magazine, delivered to thousands of households in southeast Wisconsin, where the agency operates. The e-zine is a monthly publication called Our Hometown that goes out digitally to an agency’s mailing list, including some customized information surrounding the specific agency’s current charitable cause. “As soon as you open that digital magazine, the first thing we talk about is that community cause to bring an awareness to that organization or family,” Parrish said. Word of mouth is also important in a campaign’s success. “We actually coach the staffs to really talk about it with their customers,” Parrish said. Agents are also provided with “Agents of Change” T-shirts with their agency logo on it that they can wear when they go out and get involved in community service projects. Parrish says some of the Agents of Change might not have had a connection or ties to charitable organizations in their community, or lacked the direction needed to get involved. But they want to give back, and a program like Agents of Change has provided a blueprint for how to become an agent and a small business who really cares about and contributes to their community.